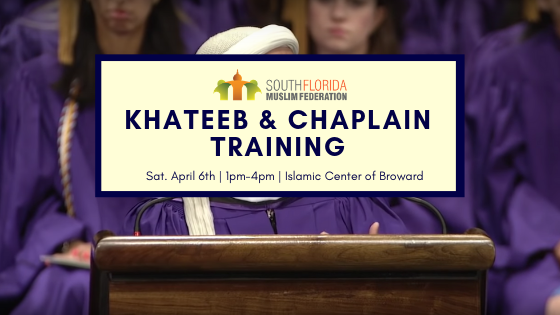 The South Florida Muslim Federation is holding a Khateeb & Chaplain Training. Anyone who is interested in learning to be a Muslim Chaplain to serve as a Khateeb in a variety of venues such as police departments, jails, prisons, hospitals, colleges, universities, and more. The greater South Florida community is experiencing a shortage in trained Khateebs to deliver Khutbahs and Chaplains services to a variety of institutions. Through feedback from the community the South Florida Muslim Federation is working with one of our members, Br. Shakeel Hye to deliver this important training and develop people interested in becoming Khateebs. We will also have Br. Wilfredo Ruiz a former Navy Chaplain Officer to offer training on Muslim Chaplaincy services for diverse institutions. Please email jkhan@soflomuslims.com with any questions. Mission Statement: To be a resource sharing hub that connects, empowers and serves South Florida Muslim organizations.